Boisterous and wild, HYENA is a synchronised display of sisterhood, strength and power; the culmination of two years research fusing circus, dance and song. These wild women epitomise their truthful fierce friendship and tribal solidarity with this creation of thrilling physical ritual and a heart-wrenching need to belong. Developed in association with: Jacksons Lane Theatre, The Point and Sea Change Arts. Supported by: Arts Council England, The National Centre for Circus Arts and The Roundhouse. 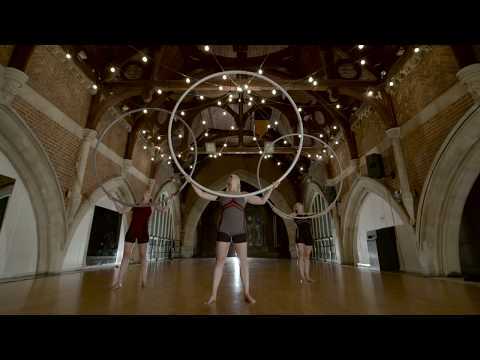 Formed in 2014 by three multi-skilled circus women, London based Alula Cyr creates exciting modern work inspired by their shared obsession for the Cyr wheel and passion to perform material with a message. Using their solo foundation skills in gymnastics, contemporary dance and live music, Fiona, Jess and Lil began exploring their trio potential at The National Centre for Circus Arts in 2012. Since graduating they have performed in the UK, across Europe, on national television, broken world records and have become renowned for their innovative and experimental approach to Cyr Wheel, creating structures with the wheels to handstand on, tumble through and use as a tight wire as well as executing synchronised spinning, doubles and triples manoeuvres on a single wheel! The Alula ladies are a female-focused collective that exists to strengthen and unite women and young girls by engaging them in contemporary circus.